Ready to save the day, this PJ Masks Upholstered Chair from Delta Children is a great place to rest after a busy night solving mysteries and eradicating mayhem. 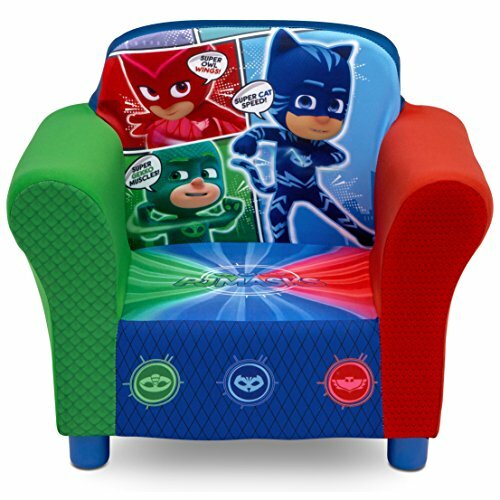 Covered in colorful graphics of your child's favorite heroes, Cat boy, Owlette and Gekko, this sweet chair is full of super fun style. Built for years of use, the chair features a sturdy hardwood frame, storage pockets on both sides and a padded seat that is perfectly sized for your growing toddler. About PJ Masks: The PJ Masks is a show about heroism. Super-heroism. Only our superheroes are kids. By day, 6 year olds Connor, Amaya and Greg go to school like everyone else. But when something goes awry in the city, these special kids, filled with curiosity and a sense of justice get ready for their mission - but they have to wait until night fall when the city is asleep and they can go un-detected. As night falls and they put on their pajamas and activate their animal amulets, they magically transform into superheroes - Cat boy, Owlette and Gekko and become the PJ Masks. Here comes Cat boy - super fast and agile, Gekko - super strong and can scale walls, and Owlette - with the ability to fly and see great distances. Together these three can tackle any situation and embark on action packed adventures, solving mysteries and mayhem across the city. Watch out night-time baddies - the PJ Masks are on their way, into the night to save the day.